. : Optics & Photonics Focus :: Bionic Lasers :. Science relies on precise measurements. But how precise can a measurement be in principle? A new experiment shows a surprising new limit, together with a way around that limit. In the dawn of the third Millennium, lasers are fast becoming man’s best friend. Be that as it may, the world still perceives them as cold, lifeless devices. Can that image be shaken off, or even turned around? Can lasers be perceived as something that is, on the contrary, warm and full of life? A lasing cell. Certain fluorescent protein producing cells can be made to emit laser light if placed inside an appropriate optical cavity. 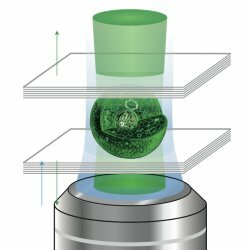 Malte Gather and Seok Hyun Yun have obtained a green laser by placing a GFP-producing mammalian cell between two highly reflective Bragg mirrors. We can hardly imagine life without lasers; lasers without life, however, are a different story. We think of lasers as sophisticated, yet cold and, precisely, lifeless pieces of optoelectronic technology. Malte Gather and Seok Hyun Yun, from the Harvard Medical School in Boston, Massachusetts, USA, are now challenging this preconceived image by getting certain cells to emit a bright green laser light. The difference between a generic light and a laser light is the same as the difference between a crowd of generic people and a crowd of clones. Indeed, the photons making up a laser beam are all identical copies of one another: they all have the same color, all the same direction, all the same phase. Indeed, a laser beam is monochromatic, directional, and coherent. In order to generate light with these properties, a photon must be cloned repeatedly. This is achieved by exploiting a phenomenon known as stimulated emission, originally predicted by Albert Einstein in 1917 : when a molecule is in an excited state, i.e. when it has some extra energy, it can relax to its ground state, thereby releasing the extra energy in the form of a photon; a photon impinging on the molecule can create a clone of itself by stimulating such relaxation of the molecule. With one stimulated emission we get two identical photons, which can impinge on two other excited molecules. Four identical photons… impinging on four molecules… eight! This makes for an exponential number explosion. A crowd of identical photons is created. Of course, since photons are very fast — they travel at the speed of light, that is, at about 300,000,000 meters per second, — one needs to confine them within a small volume, by using a pair of mirrors, for example. In essence, the description of any laser is the following: a bunch of excited molecules kept between two mirrors so that a laser beam can build up by taking advantage of stimulated emission. Until Gather and Yun’s work, all lasers have been optoelectronic manmade devices. However, some cells can produce a particular protein, known as Green Fluorescent Protein (GFP), which is excitable by light and, in principle, can be used to make a single-cell laser . "It all started out of curiosity," explains Yun. "GFP is widely used in biomedical optics. One day, we wondered why GPF had never been used to build lasers. We made a simple calculation and we knew from the beginning that it would work." GFP is quite an important protein for biologists and biophysicists — so important, in fact, that it earned Shimura, Chalfie and Tsien the 2008 Nobel Prize for Chemistry. Shimura actually discovered GFP back in 1962 in a species of bioluminescent jellyfish . Important as this discovery was, it wasn’t until 30 years later that Chalfie and coworkers found out how to use GFP to image cellular structures by genetically modifying cells so that they expressed GFP under certain conditions, which could be visualized with a fluorescence microscope . It is mainly thanks to GFP and other molecules of the same family that we now have so many stunning images of cellular anatomy. Given the importance and widespread use of GFP, one might wonder why people didn't use it to build lasers before? "Maybe because there is a gap between the biological and the physical communities," conjectures Yun, "which has only recently begun to narrow"
Gather and Yun took a cell that was expressing a GFP whose fluorescence was particularly bright and placed it between two flat surfaces that reflected green light alone. Then they placed the whole thing under a microscope and excited the GFP by shining short, nanosecond laser pulses. Obviously, they were careful to use sufficiently weak pulses so as not to kill the cell in the process. Some excited GFP emitted some random photons that bounced back on the mirror and stimulated the emission of other identical photons, initiating the process that a split nanosecond later produced a laser beam "strong enough to be visible with the naked eye." The first bionic laser was born. As with all great eureka moments in science, after the initial excitement has faded, the question arises: What next? Yun envisions two promising possibilities for the application of bionic lasers. Their use to obtain a more accurate knowledge of the structure and the functioning of cells: "since the lasing process is extremely sensitive to small changes of the environment we could detect small changes in the production of some proteins more accurately." Furthermore, "if laser light can be generated inside a body, it could be possible to devise new methods of medical diagnosis and treatment. The cavity might in these cases be provided by some plasmonic nanoparticles or nanoantennas with tailored optical properties." "This was curiosity driven research," underlines Yun. "I believe that the main significance of the work is to inspire people by telling them that lasers are not only optoelectronical devices, but can also be integrated into biological systems." A. Einstein, Zur Quantentheorie der Strahlung, Phys. Z. 18, 121-128 (1917). D. J. Pikas et al., Nonlinear saturation and lasing characteristics of green fluorescent protein, J. Phys. Chem. B 106, 4831-4837 (2002). O. Shimura, F. H. Johnson & Y. Saiga, Extraction, purification and properties of aequorin, a bioluminescent protein from the luminous hydromedusan, Aequorea, J. Cell. Comp. Physiol. 59, 223-239 (1962). M. Chalfie, Y. Tu, G. Euskirchen, W. W. Ward & D. C. Prasher, Green fluorescent protein as a marker for gene expression, Science 263, 802-805 (1994). Malte C. Gather & Seok Hyun Yun, Single-cell biological lasers, Nature Photonics (2011) 5, 406-410 (link).